On Sunday, July 6, 2008 a group of women from different countries together created a ceramic piece at the Wd8 Art Center in Austria. It was the first time that they worked together. None of the persons in this video knew each other before. The relief that was made during this workshop was the first art work that they created together. More works were made during the following days at the Styrian Summer Art Symposium 'mother earth'. Land artist Heidi Zenz visited Walkersdorf during one week in June 2008. Highlight of her stay was a wonderful belly dance performance in the former cow barn. The video of the performance was shown during summer in Pavel House as part of the exhibition 'Diwan' at the regionale08. The video was also part of the media installation in Wd8 in Juli and August 2008. 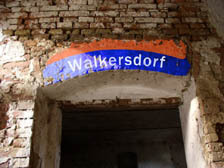 In the project 'Walkersdorf - Center of the World', the small wine-cellar in the old Wd8 farm is turned into the 'Center of the World'. As a first step, a virtual metro-network is created. A metro-network that connects the European capitals Ljubljana and Budapest as one line of the network and the European capitals Vienna and Zagreb as the other line. The intersection of those two metro-lines is exactly in the small village Walkersdorf. Here, in this village, in an old wine-cellar, is the main metro-station where passengers can change the trains from one direction to the other. Presented as a media-installation, experiences, impressions and inputs from the different parts of the imaginary metro-network, are connected and mixed together, turned into the main metro-station of the network. 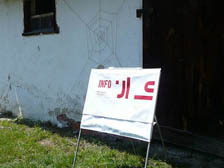 During two months in Spring/Summer 2008, the old wine-cellar will be turned into a lively collage of impressions, sounds and images, presenting the not-so-far away neighbourhoods of the village to the local people. At the same time the local people are invited to contribute their messages, wishes and dreams to the network, to send them into the different directions into the world.